I asked Sarah if I could contribute because we are expecting a baby in early September, and my mind is already reeling with things I want to buy. Since this is our second, I think that I learned some things around last time, and want to attempt to right some wrongs. 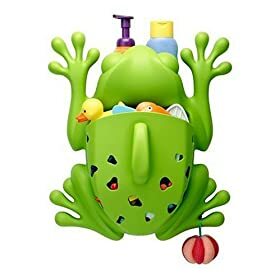 However, before I start with baby things, I wanted to comment on something our 4-year-old Eden received for her birthday this year - the Boon Frog Pod. I mean, since most of the rest of my posts here will be for the newborn and younger, I may as well pay all my dues upfront. I think the thing that I like about it best is that it's just so huge and adorable. It feels solid and made to last. It's easily cleanable, and you just want to smile looking at it. I love funny animals. Eden does too - we bought her new PJs with turtles on it, and she they are just the best fun. So frogs are good too, and the bigger and greener, the better. 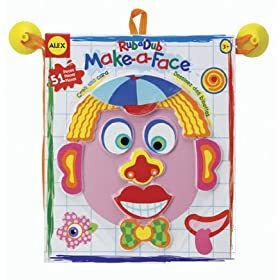 Together with the frog, we also got the Alex Toys Make a Face , which she also thinks is hysterical and keeps her busy while we wash her hair. She makes some pretty good faces, and we keep them up from day to day all over the bathroom wall! A new take on dynamic bathroom decor. Coming soon.....back to baby....and co-sleepers. Hila is wearing her frog stretchy right now. It's my favorite. Isn't it amazing how in real life an animal can scare us but printed on clothing or made up in plastic, all of a sudden we love them? Anyways, keep those posts coming!